Click the title above to take the KXLY survey and leave comments regarding Mayor Hession's political move. You can remain anonymous or not leave comments. NARRATIVE: On Monday, July 23, 2007 at 5:30 PM, 6 Companies of Spokane Firefighters, 3 Engines, 2 Senior Ladders and 1 Heavy Rescue under the direction of Battalion Chiefs Cornelius and Inman responded to a reported commercial structure fire at Whitley Fuel site located at 2733 North Pittsburg Street. 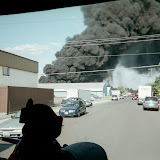 The first company arrived within minutes to discover heavy smoke and fire showing from a two-story warehouse with multiple vehicles involved-one primarily being a fuel tanker containing several thousand gallons of fuel. Initial companies immediately requested a second alarm which was followed in quick succession by a third alarm request. All three alarms included all of the City of Spokane's 17 fire companies and available Chief Officers. The building's contents included gasoline, diesel fuel, racing fuel, motor oil, hydraulic transmission, heavy lubricant oil and hundreds of other unknown substances packed into multiple stories of storage. Despite the extreme amount of heat and multiple explosions from massive amounts of stored hydrocarbon chemicals, Firefighters were able to confine the blaze within the area surrounding three main buildings. The heroics and aggressiveness by the Spokane Firefighters cannot be overstated. Without their cooperation and professionalism this incident would likely have turned into a catastrophic event with enormous loss. Athough the fire continues to burn at the time of this release, the main threat from potential fire spread or explosions has been completely mitigated. Multiple companies of recalled , off-duty firefighters were utilized last night to remain on scene and continue to extinguish "hot spots" and provide site safety for the scene. Five mutual aid companies were quickly moved into many of the City's fire stations. The mutual aid companies responded to nearly 20 calls for service which were unrelated to the incident during the initial period of the fire. Specialized crash rescue trucks from Spokane International Airport and Fairchild AFB were also utilized through the mutual aid agreement. Both apparatus were brought directly to the scene for their AFFF (Class B Foam) capability. A Type III Incident Management Team made up of Chiefs and specially trained officers from a diverse cross-section of Spokane's Fire and Law Agencies was also dispatched. The Type III Team (called MIST) was utilized to build a plan for the next two operational periods to include objectives such as mitigating the ecological impacts as well as the complete extinguishment of the fire. The team worked closely with SFD Chief Staff through a liaison to establish priorities and bring multiple agencies (SPD, SFD, DOE, Water/Sewer Department, Mutual Aid, Demolition, Business Owners, Department of Health.etc) all together in collaboration. The atmospheric conditions remained a challenge throughout the incident. While in their personal protective clothing and mandatory use of SCBA (Self-Contained-Breathing Apparatus) the firefighters had to endure triple digit temperatures, a threatening lightening storm and several periods of wind gusts which made firefighting extremely difficult and challenging. Rehydration and constant rotation of companies were necessary to prevent illness and injury of the firefighters from the extreme heat and conditions. Staff personnel, including Dr. Edminster (FD Physician Director), monitored firefighter's vital signs closely and also treated three minor injuries during the incident. Despite the safeguards, three firefighters received treatment for minor injuries. There were also civilians that were treated for smoke inhalation, however denied transportation to the emergency department. PROBABLE CAUSE: The cause is still under investigation. I am expecting to facilitate a press conference later this afternoon regarding the event and consequences expected thus far. If you have any additional questions, please call me. DAMAGE EXTENT: The Whitley Warehouse (75' x100', 2 story un-reinforced masonry building) is completely destroyed. A nearby 20'x120' wood frame and concrete block building is also significantly damaged, albeit repairable. The nearby office buildings received moderate damage as well, but specific information regarding the estimate was not available. Fifteen (15) passenger style vehicles and vans located in parking areas are completely destroyed. A semi pulling a tandem double fuel trailer as well as a fuel tank are also destroyed. The on-site, fixed flammable liquid storage containers all received varying levels of damage.